Disclosure: I got this product as part of an advertorial. We received sample items to help facilitate the review. All opinions stated are genuine and my own. JAM Tyvek Envelopes and Recycled Red Paper. JAM Paper & Envelope products are top quality, colorful, and they come in a wide variety of colors and styles. In addition to paper and envelopes, they also offer office supplies, portfolios, binders, Gel Pens (so have to get me one of those!! ), and so on and so forth. The array of items offered is impressive! We received a pack of recycled red paper and two Tyvek envelopes. JAM paper comes in 25 styles & hundreds of colors! The paper comes in 25 styles and hundreds of colors. What better color to have for a review though, than red when Valentine's Day is just around the corner? 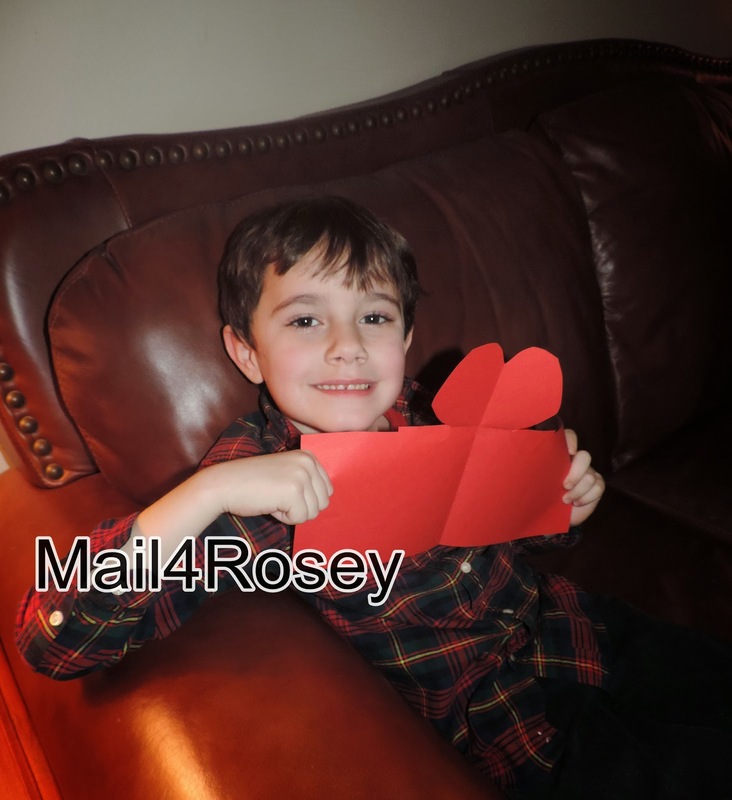 My son used a sheet of the paper to make a pop-up heart card. I thought the card was going to be for his giiiiiiiiiirlfriend. 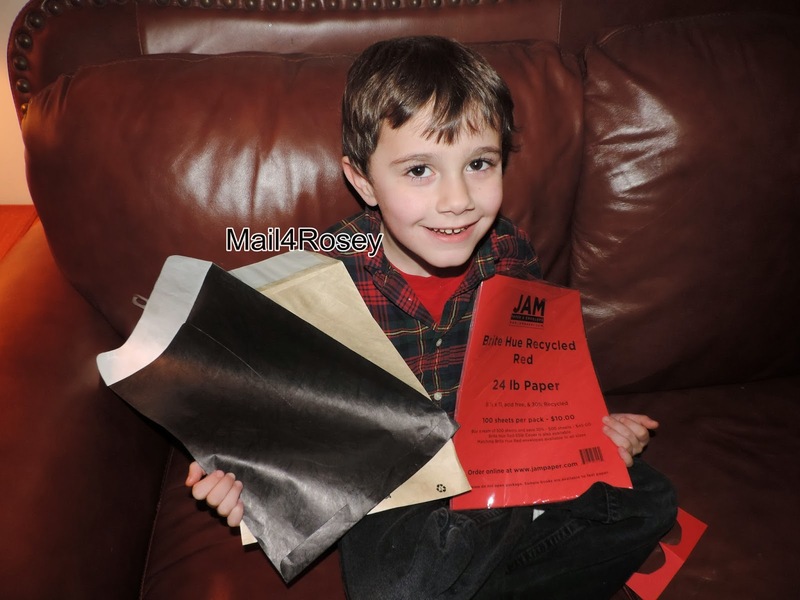 Over the long weekend, he'll make some other projects with the paper, I'm sure. Maybe we'll even make something for grandma (my mom), who lives in a different state. We can mail it to her in the Tyvek Envelopes we received. The Tyvek is great because it's stronger than paper, and not at all likely to rip. You can learn more about JAM Paper and Envelope Products by visiting their website. You can also follow them on Twitter and/or Facebook. You definitely want a good strong envelope when you're sending special handmade gifts. Grandma will want it to arrive perfectly intact! My two are always making paper crafts/projects and there is definitely a difference between the cheap stuff and the higher quality paper like this. What a fun thing to do. I want to join in the fun. I have not heard of them before, but from your review, it sounds like a great product. I hav not heard of this before but looked like he had fun making it aww! my son draws and my daughter cuts out thepaper to make things.. its a good combination! Yeah, our fridge is used for the same purpose. Only that we've got a zillion magnets on, sometimes I'm afraid to open the door. Looks like great craft paper! I really want to get into crafts with my girls. I will have to check them out and get some for my princesses! Thanks! Looks like fun paper! Have a great weekend. Aww, so cute! Looks like nice paper to make crafts with. My kids love doing all types of crafts and projects. I bet they would love doing this one too! I liked using Tyvek envelopes especially when I am enclosing something important. That card was very sweet. I use Tyvek envelopes for sending important things in the mail. Tyvek envelopes rock! Great that you got to try some fun products too. I bet your kids have fun with all of these products. Papercraft is so much fun and its definitely good to make sure you have a strong envelope I've had some distastes in the past with ones I have brought. Your son is so sweet! Love the card he made for his dad! 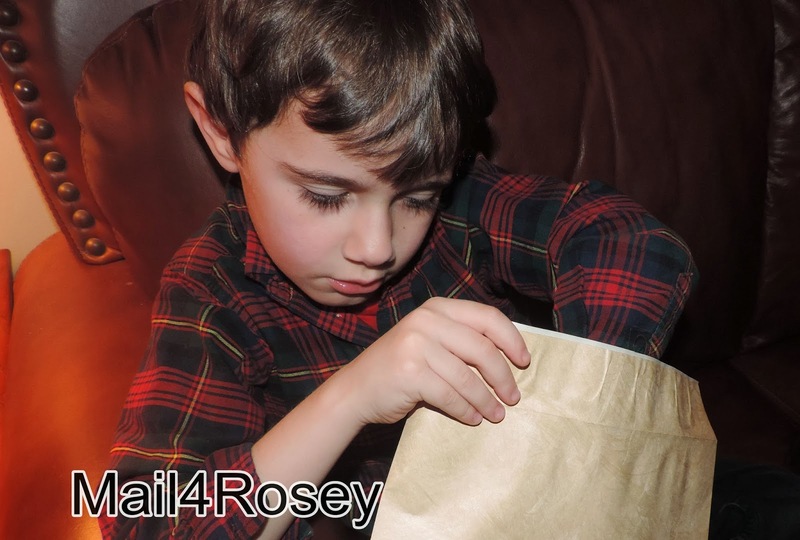 Have to check out those Tyvek envelopes too! I love tyvek envelopes, they make me feel so much better about sending important things. We do crafting projects all the time so I love that he is being creative with the products. I will have to check them out and see what I can find. I love all kinds of paper and pens. The whole time I was reading your post, I was envisioning all the fun stuff I could do with this paper whenever I'm art journaling. Thanks for the reivew! Tyrex envelopes are definitely stronger and do hold up very well when you are mailing something-especially when it is a precious card to grandparents from their grandson! 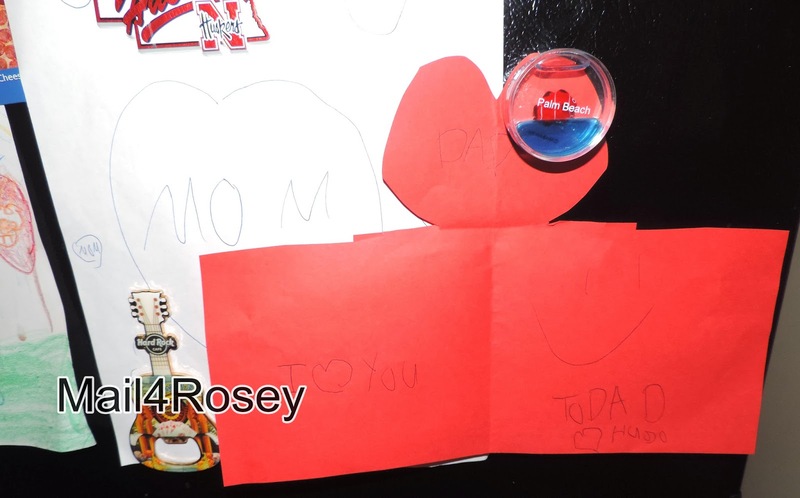 You can do so much with different colors of paper-and I love that the heart was for Dad! I love doing crafts so this is definitely something to think about. Thanks! What a great looking envelope :) Looks like great paper! Paper crafts are always fun! I won a Silhouette Studio last year, and now that I have some free time coming up, I want to learn how to do more paper crafting with it. This sounds like great paper for that purpose! I've ordered translucent envelopes from them before. Very cool! Looks like your little one had lots of fun. Quality paper products are the best and actually end up saving you money when doing paper crafts. I think my sister has something like this somewhere in her room. Aww, those are adorable. We are addicted to paper products in our house. That is really creative! My daughter would love these kind of products as she love to do arts and crafts. Awww! So sweet of him to make a card for daddy!!! That is so sweet of him. Creative and thoughtful kid. And so sweet for his dad! My kids really enjoy paper crafts. They once painted paper to make "red paper"
I love how creative kids can get with this. This will make for some really nice Valentine's Day crafts. Oh that is awesome. This is something that I know my lil ones will enjoy! and yes great for the Valentine Day! This is a great little product for Valentine's Day. I bet my daughter would love them to put letters to family/friends in. How sweet! I loved paper even as a child, too - I still find piles in random boxes. I like that the paper is recycled - and that he made a card for Daddy!! Tyvek is a brand that I'm not familiar with, but it sounds like they make great paper goods. Thank you for this review. Jam is the company. Tyvek is the style of envelope, they're rip-proof, which I love!! Looks like some great paper for Valentine crafts. I will have to check out JAM paper for our homemade cards. Tyvek Envelopes, isn't Tyvek what they cover houses with before they put siding on them to keep the weather out? Or am I thinking of something else.